HTML contact forms are one of the most common components in most websites or blogs. They are becoming highly popular on the web for creating forms of collecting mailing list, creating contact form, creating survey form, creating online payment form and lead generation form. Here I have created a list of best 10 online contact forms builders for free to use on your website along with their features. You can create nice and simple HTML contact form using these tools given below. Foxyform is a free and easy to use online form builder, you can create your own contact form in just a few seconds. You can place upto four fields, title, name, email and subject on a form and allows you to make them required field as your requirements. It also allows you to adjust background color, foreground color, font and font size as advanced setting of your form. You can set target email address from which e-mail address shall the form data be sent to. After successfully creating a form, you will get a code to use on your website easily. 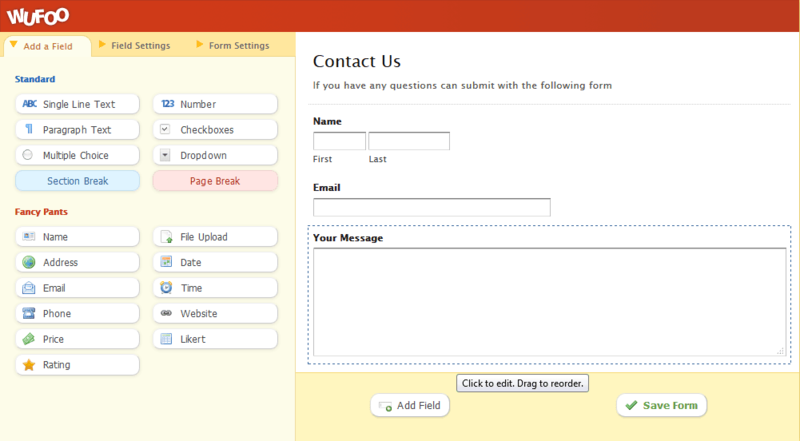 SmartAddon Contact Form is another free and easy to use online contact form builder. All the features on this form are similar to Foxyform with addition form fields like First Name, Last Name along with Name field. You can also add Phone Number and Website field to this form, after adjusting all the settings, generate HTML code and place on your website. 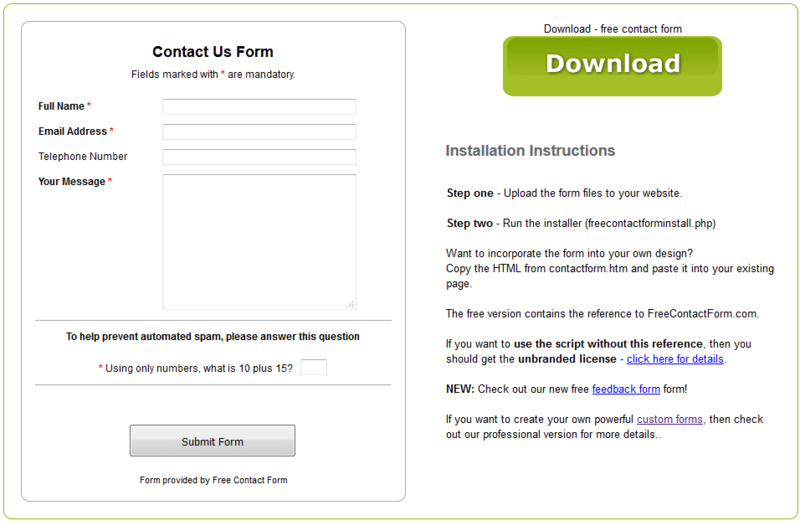 Free contact form provides free to use and ready-made contact form for your website. You can freely download the full source-code and use it on all your websites from download button provided on their website. The preview of the form and installation instruction are given on the screen below. 123 Contact Form provides you HTML contact form code you need to insert into your contact page. You just need to sign up for free and start using our html contact form. You can also create professional contact forms with the plans other than free plan, which are gold, platinum and enterprise plans. With a free plan, you can create up to 5 forms and 100 submissions per month. Using typeform, you can create unlimited forms with advanced features. It also allows you to create web forms, online surveys, questionnaires and polls along with contact form. Along with main form you can also create welcome screen and thank you screen. This form is best suited for creating questionnaires and surveys forms. After successfully creating a form you can get the HTML code and embed on your website. Jot Form may be the best option for creating both free and pro featured forms. Along with basic form tools, jot form allows you to create survey forms using different survey tools, payment form using different payment tools and widgets using widget tools. You can get HTML code to embed on your website and can get responses from a form via email. It has three pro plans bronze, silver and gold along free plan. With a starter free plan, you can get upto 100 monthly submissions and 1000 monthly form views. 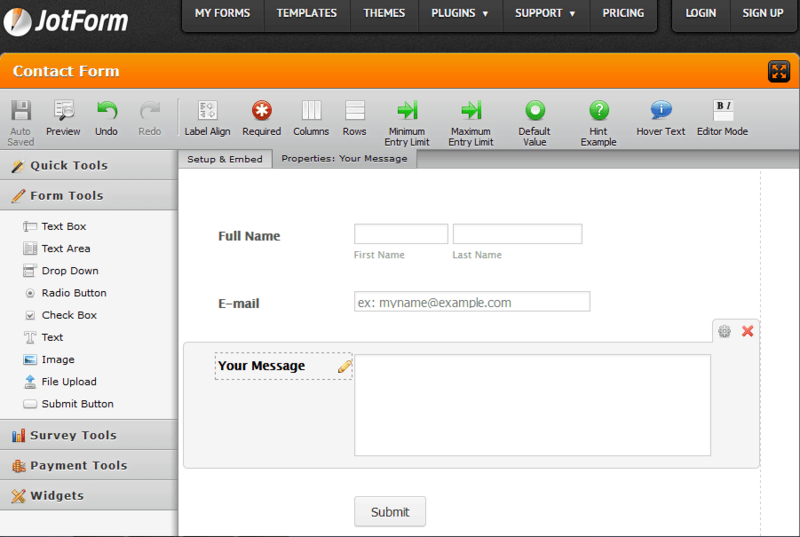 Formsite allows you to build contact forms along with other web forms, online surveys, questionnaires, and polls. You can create online forms and survey forms with custom look and feel, also allows you to get responses through secure submissions. You can also collect payments through order forms, paypal, Authorize.net, stripe, credit card and checks. You can use your results to get email notifications and analyze the collected data. Wufoo was another form tools to make really nice online web forms, with a form designer provided by it. The different types of forms can be made with wufoo form are forms of collecting mailing list, contact form, customer survey form, employment application form, event registration form, online order form, party invitation form, lead generation form and bug tracker form. It provides three pro plans Ad Hoc, Bona Fide and Carpe Diem along with its free plan. With a free forever plan, you can create upto 3 forms with upto 10 fields along with 100 submissions and 3 reports per month. Cognito Forms allows you to create standard forms and easier for simple payments, which allows you to collect data from your potential customers, and then sell your products to them along with creating simple web forms like contact form. You can insert the additional fields’ like currency, price and calculation on a form as the payment feature. 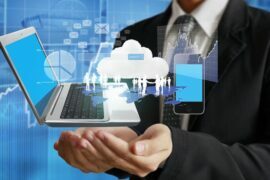 Similar to other forms given above, cognito forms provides three pro plans Pro, Team and Enterprise along with its free plan. With a free individual plan, you can create unlimited forms for one user with upto 500 submissions per month. After reading about all the above online form builders, you may ask which one is the best web form builder. It may different choices according to the purpose of the web form, if you want to use simple to use contact form only, Foxyform, SmartaAddon Contact Form and Free Contact Form may be the choices of your. If you want to use full featured forms for collecting emails along with contact form on free, I would recommend using SumoMe contact form and Email list builder form. If you want to add simple payment feature on a form you may use Cognito Form builder. 123 contact forms may be the best option for creating professional contact forms. You are always welcomed to leave comments here with expressing your experience on those online form builders which I have listed above. If you have good experience with any other form builders, you may also mention on the comment section below.